Frida's Fruit Fiesta is a very fun and colorful game for kids ages four and up. Educational games can be a great way to help your kids learn certain topics. Frida's Fruit Fiesta is an alphabet learning game that engages the kids with fun gaming components like spinners, a game board and fun stands with letter cards. Kids love to play games and such a colorful and kid friendly game like Frida's Fruit Fiesta is sure to light up their eyes. Great for tropical themed birthday parties or just as a fun gift. Check out more about how to play below. Get your copy of Frida's Fruit Fiesta today. Use your alphabet matching skills to be the first to place four fruit bowls in a row. 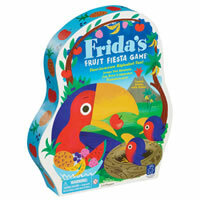 You get a rainforest game board, 26 fruit bowls, 1 Frida squeezer, 4 nest cards, 1 triple game spinner and the official Frida's Fruit Fiesta game rules and instructions. Please keep in mind that the official Frida's Fruit Fiesta childrens rules and instructions could be different depending on the game version you have. The rules below are some of the exact directions on how to play Frida's Fruit Fiesta. Share with us your comments, funny stories, tips, advice, strategies, creative ways to play, questions about how to play, problems with the rules or anything you want about Frida's Fruit Fiesta. All submissions will be reviewed within 24 hours. Click here to add your Frida's Fruit Fiesta comments.